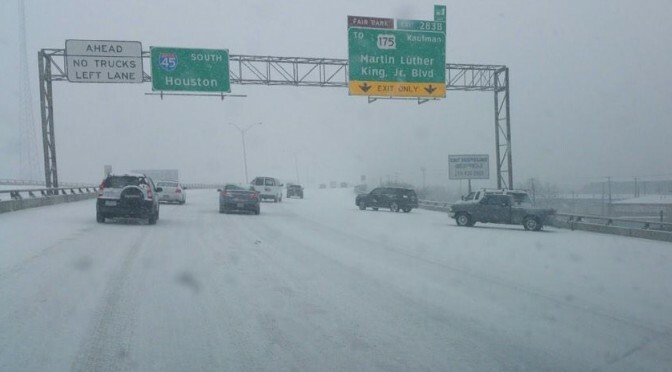 Ask almost any Texans living north of Greater Houston and they can tell you… 2015 has been an exceptionally rough winter for the Lone Star State. North Texas is just now thawing out from a rare March snowfall, in a year that has seen record winter events. But long after this (hopefully) final bit of snow melts, municipal governments will still be working to deal with the storm’s aftermath. The exceptional Winter has ravaged Texas roads, leaving a staggering number of potholes and other damage to city and county infrastructures. Fixing that damage is sure to be costly, and as things appear now, those additional costs are of no concern to state lawmakers in Austin. While state coffers are so flush with cash that Texas lawmakers might leave billions unspent this year, local governments are continuing to borrow heavily to provide services in a fast-growing state. Between September 2013 and August 2014, local governments in Texas borrowed more than $5 billion, bringing the total local debt statewide to $205 billion, according to the Texas Bond Review Board. State legislators have noticed — and they’re taking action. More than a dozen bills have been filed this legislative session aimed at restricting how counties, cities and school districts can borrow money. While some lawmakers have argued that local entities should do more to live within their means, cities, counties and school districts have countered that it’s the belt-tightening at the state level that pushes more costs further down the line. Lawmakers at the Capitol are all too quick to criticize cities for having to borrow money, while they simultaneously tout the “Texas Miracle”, hoard cash away for themselves, and demand massive property tax cuts at the expense of higher sales taxes. The one discussion they’ve yet to have in Austin?? If any of that state surplus will be used to aid Texas cities with the massive task of actually making this state work. And sure Governor Abbott has at least said that the state’s roads and schools should be top priorities for the session. But he has yet to explain how this additional spending will be funded if the $4.5 Billion in tax cuts goes through as well. Perhaps he wants cities to take out debt for those too.